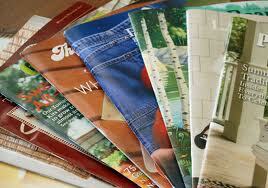 Display your products with style and pizzazz with custom printed catalogs that truly stand out. With vivid image printing, you can bring your products to life and sell like never before. Work with the Minuteman Press North Dallas marketing and design team to create a comprehensive catalog that's both effective and aesthetically pleasing. We are a commercial printer who focuses on high quality printing and exceptional service. If you are looking for a printer with experience that you can trust, give Minuteman Press North Dallas a call for your commercial printing catalog needs. We are conveniently located in North Dallas off of Preston Road, so if you are in Dallas, Addison, Carrollton, Richardson,Plano or anywhere in the Metroplex and want someone you can meet and see in person, we are here to be your printing partner.